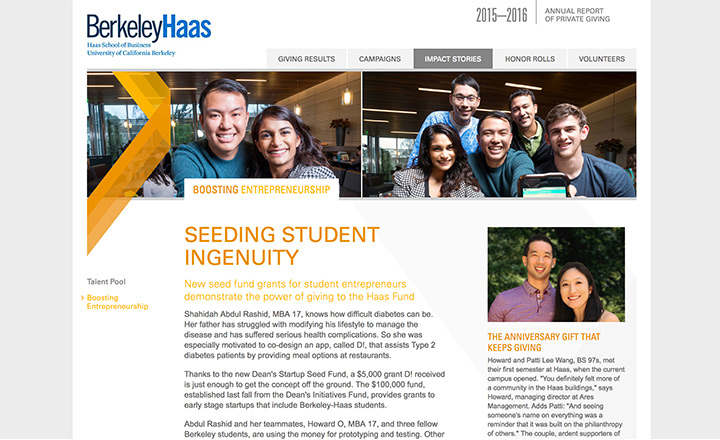 PROJECT: As the second-oldest business school in the United States,The Haas School of Business at the University of California Berkeley is one of the world’s leading producers of new ideas and knowledge in all areas of business including the distinction of having two of its faculty members receive the Nobel Prize in Economics. I was contracted to develop the online version of Haas’ annual report, it was one of the largest projects I’ve worked on to date. A massive amount of data and testing had to be inputted into the site to make sure it worked on all browsers to compensate for the large international audience UCB attracts.